Housed in what was previously a working garage (and a hairdressing salon! 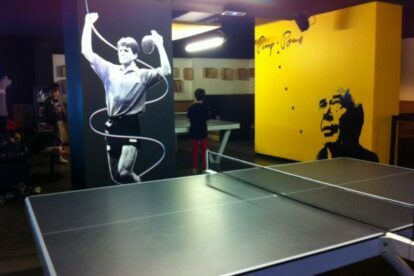 ), this large space is now home to around 10 ping pong tables spread over two levels. The tables are of course the major attraction, but there is also a decent bar which serves snacks and reasonably-priced cocktails, and comfortable zones in which to relax whilst waiting for a table. In the evenings at weekends the bar becomes almost a ping pong disco, with live DJs spinning discs whilst you work on your topspin. Personally I’m more likely to be there on Sunday afternoons, when tables are available quickly and when you can take breaks in between sets to enjoy a pretty good brunch.